Another year has passed, and great things are coming out of APH Networks as usual. With lots of content returning to our weekly review schedule in collaboration with the rest of the team, it's definitely a great way to start off the year. I have the pleasure of doing the first power supply report of 2010, and man, do we have an interesting one this week. SilverStone has been highly regarded for both their quality chassis and power supplies over the years. From their Element line of PSUs, all the way to their Zeus series of power supplies, they have been known for both quality as well as value. They have used many OEMs ranging from FSP to Impervio; it is quite interesting how all these different OEMs branded under SilverStone have done so well. The only overlapping factor comes down to excellent designs by SilverStone, as well as generally excellent picks into what it would rebrand to maintain an optimal strike in both quality and performance. What really surprises me is that, over the years, SilverStone has yet to sell a power supply with more than an 80 Plus Bronze certification. But not to fret, as the latest addition from SilverStone in their Strider series -- now deemed the Strider Plus -- comes in with their first attempt at the 80 Plus Silver game. Some would even go as far as to say it is their first "stride" into this part of the market (Thanks to Anthony for the inspiration for that semi-lame joke, haha). 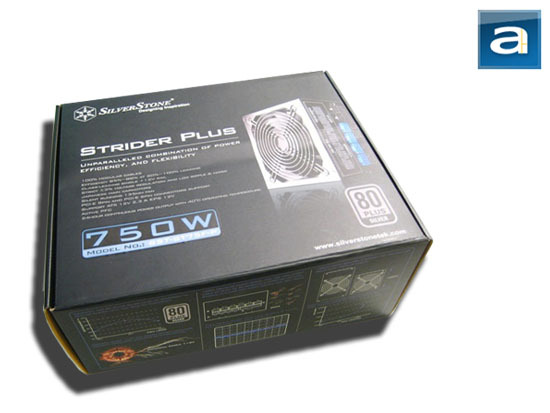 Today, we have the SilverStone Strider Plus ST75F-P 750W in our office for testing. Let's take a look into what SilverStone came up with on their first 'stride' into this territory! Our sample unit came in an oversized brown corrugated cardboard box from SilverStone's American offices in California, USA. FedEx Ground was used to ship the package, and it arrived quickly. 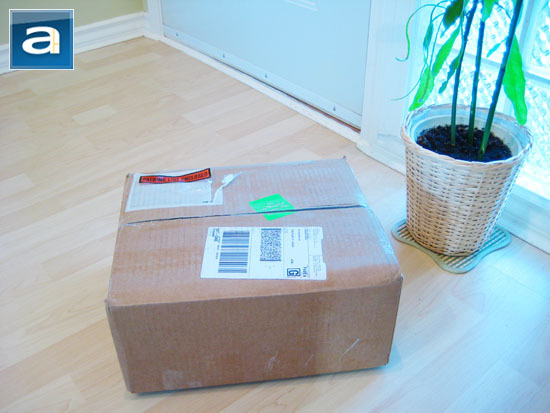 The package arrived in pristine condition, and even had scarcely a scratch on the package itself. The box was huge; so huge, in fact, that I thought there may have been more than a power supply inside. Boy was I ever wrong. The box only contained the SilverStone Strider Plus ST75F-P 750W retail box, as well as a thin layer of packing peanuts. Packaging was fine and nothing was damaged, as the box for the Strider Plus barely had any room to move around inside anyway. To say the box of the SilverStone Strider Plus ST75F-P 750W was interesting would be an understatement. However, its interesting nature does not come from the characteristic of the box itself, but rather the sheer size of the box. To be honest, I would not be surprised if a tree or two had been chopped down to make a box this large, haha. The box does feature a black colored background, with mostly blue or white text on it. The front has the SilverStone logo near top left corner, with 'Strider Plus' text printed boldly a distance beneath it. A picture of the power supply is then located to the right of all the text, as seen in the photo above. The only thing in light blue as aforementioned is the 750W power rating in huge letters, located near the bottom of the box. The bottom of the box has mainly text on it, designated for three models of the Strider Plus rated at 750W, 850W and 1000W. All of these are listed in multiple languages, ranging from English to Chinese. It's kind of small, but for most of us it shouldn't be too hard to read. 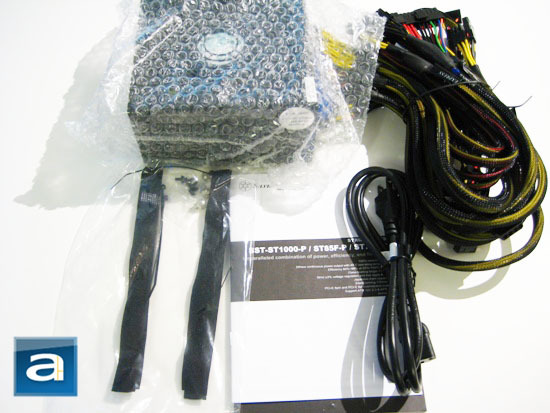 The left and right sides of the box are used to list the technical specifications and multitude of connectors for the PSU. Finally, some interesting information about the technology implemented in the SilverStone Strider Plus ST75F-P 750W, including some in house tests, can be found on the bottom flap of the box. The included thumbscrews can be quite useful for installation purposes, and potentially makes it a lot easier to swap out power supplies. With the included zip ties, it is clear that SilverStone has thought about the different factors in cabling organization, such as strapping cables together during installation for a cleaner looking build. Since the power supply is modular, we will take a deeper look into the multitude of included modular cables later on in this report.